Pioneers in the industry, we offer dry fruit serving tray from India. With years of experience in this domain, we have carved a niche for ourselves, by offering a wide assortment of Dry Fruit Serving Tray. The offered Dry Fruit Serving Tray provides a great comfort for gifting purpose and helpful to the user. This Dry Fruit Serving Tray is used for gifting to the employees working in MNC, bank or life insurance company to use for many purpose. The offered Dry Fruit Tray is highly cost effective and well known for their excellent finish, durable standards and elegant designs. Utilizing the modern technology and latest machinery, we bring forth the wide array of Dry Fruit Tray. This dry fruit tray is aesthetically designed by our affluent craftsmen utilizing excellent quality material as per the contemporary trend of market. 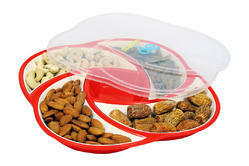 The offered dry fruit tray is made available in various designs and sizes to suit demands of customers. 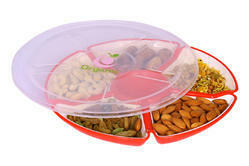 Also, we are giving this dry fruit tray to customers within a given time frame at affordable price.